The presentation of the first of CPT’s new accreditations. E-leather displayed its capabilities with styling, structure and stitching. Wheel and Motion (WAM) displayed its new stock of wheeltrims. New seating material from Fabercon. TotalKare displayed its S6cf cable-free mobile column lifts. Zeta Automotive’s EconoSpeed Connect unit. Mobile Onboard showed its new Beam 200series. Ticketer has increased the speed of its remote ITSO top ups and greatly enhanced the hosting capabilities of its ticketing machine. The Hawk passenger seat from Cogent. If you visited Coach and Bus Live, you will know the exhibition halls were packed with not only the latest vehicles in the industry, but swathes of new products and technologies. Chris Peat toured the stands to bring news of what was displayed. Promoting its network of professional coach, minibus and taxi operators was Coach Hire Booking. The organisation offers access to a variety of contracts, including private and corporate hire, as well as pre-planned and emergency work. Del Haggarty of WTS Just Coach Drivers believes he has a solution that will revolutionise the industry, solving the problem of driver shortages. His company launched a new contracted drivers service, which starts this winter and lasts into next year. The contracts make it easier for operators to hire a driver for whatever time scale is best for them. AID Fuel Oils Group was promoting its range of fuel cards at the show, in addition to its free fuel site locator app. The application finds a driver’s nine closest fuel sites. DKV Euro Service was making visitors aware of the new German toll changes. Representatives were also talking about its fuel card services for use in the domestic market, as well as abroad. Promoting its link up as a distributor for the new TopBlue adBlue was Optimum. Representatives were keen to promote a new Euro6 anti-freeze product. Talking customers through its finance packages was Forest Asset Finance. A Rugby World Cup theme was rolled out on Arthur J Gallagher’s stand. The insurance specialists had a prize draw for a shirt signed by rugby star, Will Green. To celebrate 40 years in the industry, Wrightsure had an AEC Reliance Plaxton Panorama Elite Express III from Thornes Independent of Selby on its stand. The company provides insurance for bus, coach, minibus and community transport operators. CILT’s Busmark benchmarking club attracted a number of new members at the show. The scheme benchmarks the organisation’s operational performance with other bus and coach companies in the UK and Ireland. Each affiliate receives their own tailored report based on a survey, which identifies high, average and below average levels of performance. The Busmark Club meets quarterly to discuss the results, common issues and emerging trends. It also launched its Professional Development Directory for 2016 at the show, which offers more qualifications and training than ever before and is designed to meet the needs of professionals working in the transport sector. 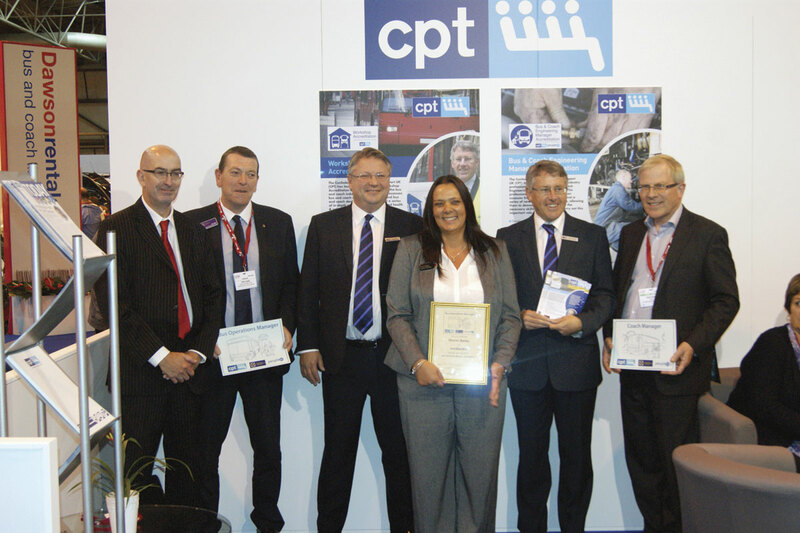 The first of CPT’s new Bus Operations Manager and Coach Operations Manager accreditation awards were presented to trentbarton during the exhibition. The awards were developed by the bus and coach industry through CPT’s Skills & Training Committee in partnership with People 1st and the Guild of British Coach Operators and are also approved and supported by the Chartered Institute of Logistics and Transport. Malcolm Robson, former Ipswich Buses MD, is the assessor for the bus version, whilst Phil Baker, formerly of Baker’s Coaches takes care of the coach side. Applicants for the accreditations must first complete an online questionnaire (on the People 1st ‘Careers That Move’ website) before being put forward for an intensive two day audit designed to allow candidates to demonstrate that they have extensive knowledge of all aspects of the Operations Manager role. CPT also launched the ‘1 in 4’ training DVD, which deals with how drivers should deal with coach passengers with mental health issues. CPT has already launched a similarly named DVD for bus drivers, which is reported to have gone down well. The latest one was developed specifically for coach drivers with the help of Skills Coaches of Nottingham, Shearings Holidays and National Express. Doing well as its digital licence checking programme takes off following the abolishment of the paper licence counterpart was LicenceCheck. The company uses live data from the DVLA database to verify driver licence information under licence from the DVLA. One of the main products on PassengerFTA’s stand was its FTA Vision tachograph analysis solution. There was also information on the benefits of membership, as well as its Passenger Transport Information and Compliance Service. Celebrating 60 years was ROSCO (Road Operators Safety Council). To mark its sixth decade in existence, it displayed a Bristol from Wythall Transport Museum. Having originated within NBC, the group aims to enthuse people about safer driving. Continuing the promotion of its CycleSafe mirror was Ashtree Vision and Safety. The Bradford business has developed a mirror designed to help eliminate accidents caused by the blind spot on a coach or bus’s side. The product will fit mirror arms of 16mm to 28mm in diameter. Making its initial foray into the bus and coach industry with its show presence was Astral Professional Chemical Solutions. Consumables and hardware, which includes polishes, waxes, carpet and upholstery cleaners, as well as lubricants and washer additives, were shown. Its also provides hand care and hygiene products and accessories. Blackpool Coach Services/West Coast Trim shared a stand with displays showing examples of their work and materials used. New wood effect flooring, called Timber, was released by AT Industries. 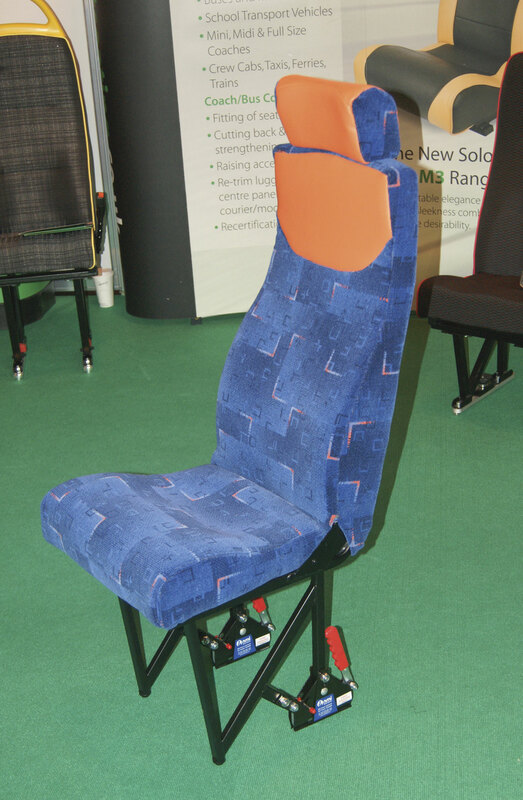 The company also had a range of automotive upholstery on show. New from Carlyle Bus and Coach was its partnership with Diesel Technic, the CV spare parts supplier. The tie means the business can provide an array of components for buses and coaches, including parts for cooling, fuel and exhaust systems, as well as engines, clutches, pedals and gearboxes. Diesel Technic’s DT Spare Parts brand has a Digital Product Catalogue available designed to make selecting the correct product easier. Taking centre stage on Compak Ramps’ stand was its NG ramp featuring ‘intelligent control modules.’ It has been designed with no moving cables, to avoid wear, and self lubricating screw nuts to help keep maintenance low. It is 40% lighter than predecessor models. Go-Ahead were reported to have fitted some of them on its buses. As well as its range of PSV specific tyres, Continental was also showing its tyre pressure monitoring system. The latter bit of kit now has a telematics arm to it, flagging up any tyre pressure problems to the back office. E-Leather was promoting its capabilities in styling, structure and stitching of its material to better match corporate liveries. 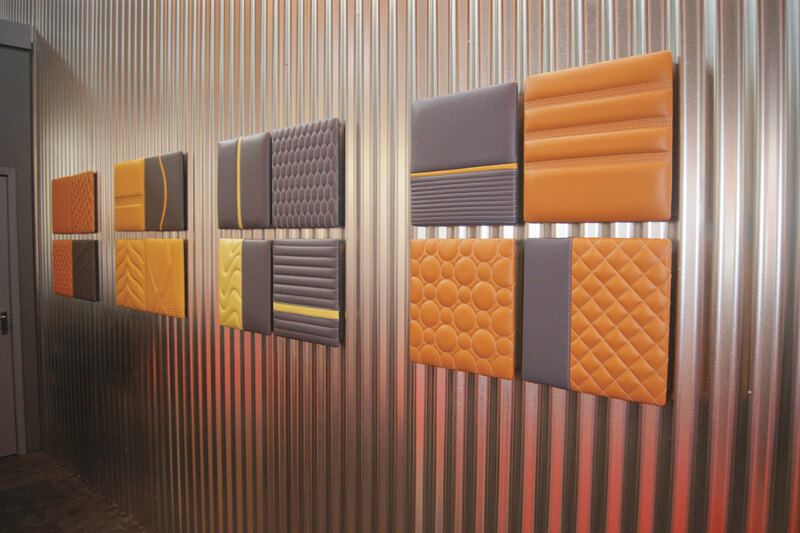 Examples of what is capable with the material were presented, displaying the flexibility it has in the way it can be presented to differentiate the interior’s design. 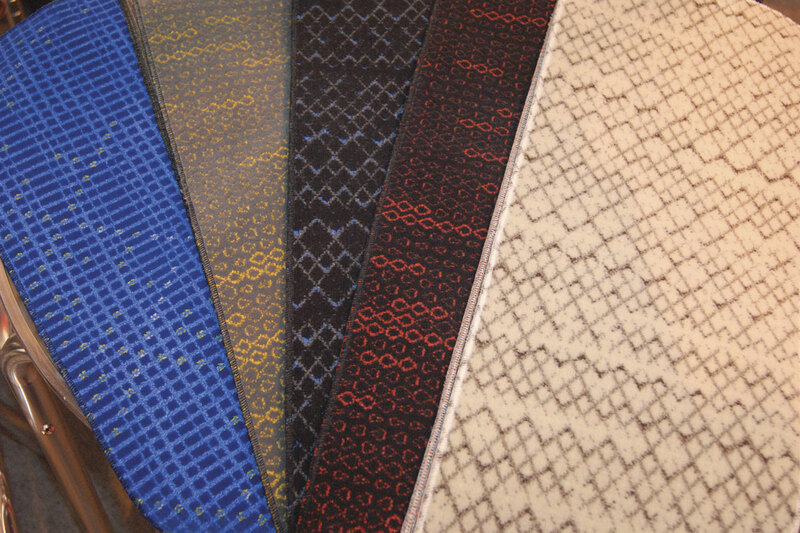 A host of flat weave seating material was shown by Fabercon. The upholstery is expected to prove popular with premium services, having done so in Europe. There were also some seat coverings with reflective and metallic flecks and designs weaved in, which have an attractive shimmer once they catch the light. GiTi Tire’s latest tyres include its GT Radial range, they include the GAU861, which is designed for driving in urban conditions with frequent stops and changes in speed and direction. It has an extra reinforced sidewall protector and robust casing construction. The GSW226 is a winter tyre for steer axles. It is M+S marked for all season capability and its wide shoulder ribs are intended to provide good resistance to irregular wear. Additionally, there is the GAR820 regional tyre for all position fitment. This is created with modern medium sized buses and coaches in mind. All three are 3PMSF tested. Hants and Dorset Trim’s display showed refinishing work on Scania gas buses for Reading Buses and refurbishment work on Cardiff’s Olympus double-deckers. Replacement of the seats in the latter had delivered a 450kg weight saving. The company is close to completing the first Routemaster being refurbished and restored to original condition for TfL. H&D can also upgrade Chapman drivers’ seats using a ProBax cushion and the seat manufacturer’s SideRiser 2 height riser. Making visitors aware of upcoming fire suppression legislation was Kidde. In particular, it was highlighting that it will become mandatory for fire suppression systems to be installed in new vehicles from 2019. The company is lobbying for all European buses and coaches to abide by this and is writing to OEMs to gain their opinions on the idea. The company had a range of its own fire detection and suppression equipment on display. Amongst its range of printed destination and Mobitec Smartblind displays, McKenna Brothers also showed its latest TFT screen. The device can be linked into the company’s LED destination blinds and can be updated in real time. It shows the next stops, can be updated via GPS and can even feature RSS feeds through Wi-Fi connectivity to allow it to show news updates. Video footage can also be uploaded and displayed. Meridian Coachworks entertained visitors with a bus racing circuit. Amongst a variety of products on display, Parma was showing its O-Trim Premia range. The wheeltrims are designed for use on the Mercedes-Benz Sprinter and Vito, as well as the Volkswagen Crafter and Ford Transit. Designed to be precision fitted, various sets are available for each vehicle. The company also displayed a wide variety of trims and wheelnuts, as well as safety equipment and tools for the industry. It was also promoting its dashboard décor kits, which can be used to enhance dashboards. Passenger Lift Services showed its EQ Ski-Locker lift, a fully automatic large passenger platform for wheelchair access. An interesting feature is its remote monitoring for enhanced performance and reduced maintenance downtime. It provides a 400kg lifting capacity with a platform size of 825mm by 1,220mm. A super low power passenger information screen was displayed by TechnoFrame. A solar powered bus stop with passenger information screen that displays the status of services was shown. TfL is currently trialling this product at Waterloo Bridge stop, one of the busiest in the city. Also under TfL trial is the SmartCity digital destination display which can achieve the same level of clarity that printed blinds can. Additionally, a range of Faigle hand straps for standing passengers to hold on to were displayed. Designed to be strong and hard wearing, they can have a display slot that can be used for advertising. 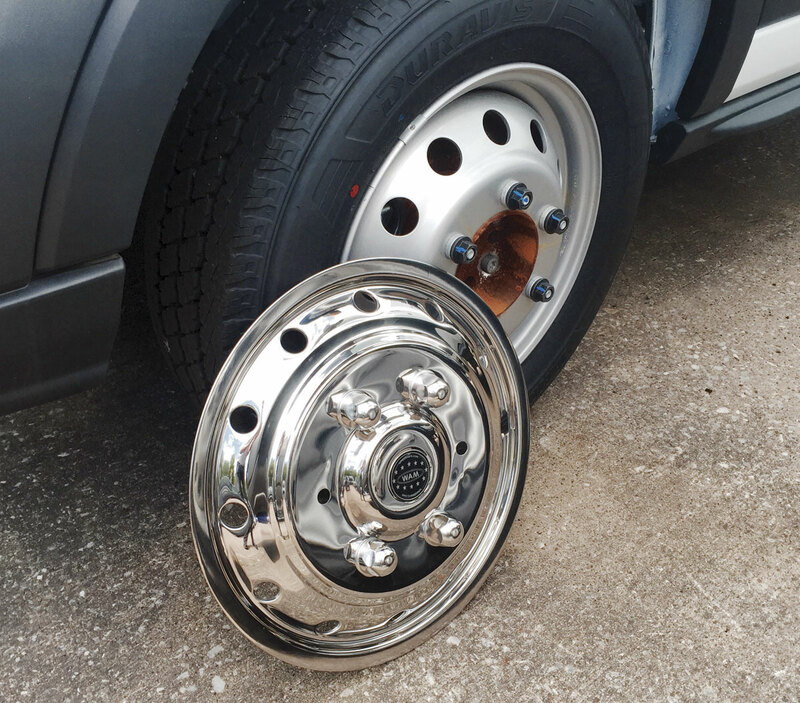 Tyreline, the UK distributor of Alcoa wheels, was showing its latest product in its Dura-Bright EVO range, which are for the Mercedes-Benz Sprinter. The aluminium wheels are designed to be lighter weight for more fuel efficiency and come with a five year warranty. 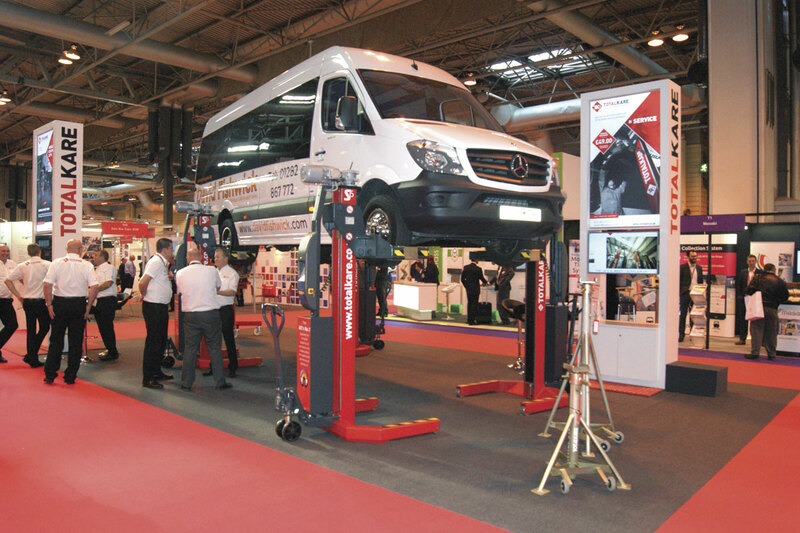 A new cassette lift was shown by accessible vehicle specialists, Unwin Safety Systems. The BraunAbility unit is designed to be light weight yet have the maximum platform size. It weighs 145kg, requires a 12v power supply and is said to be easy to install. Webasto was promoting its entire range of bus, minibus and coach air conditioning and heating systems. One of the main displays on the stand was its Air Top Evo 40/55, which is designed to offer greater comfort, safety and heating capacity for larger vehicles. Energy consumption and noise are significantly reduced by the new control system which features an automatic altitude compensation system. Father and daughter, Stuart and Pepa Smith, were promoting Wheel and Motion (WAM), their new wheel liner business. The 14inch to 22.5inch liners are available in sets or as spare parts for Mercedes-Benz Sprinters, Ivecos, Volkswagens, Ford Transits, MANs and a variety of other products. Chapman Driver Seating showed the latest advances in its range. These include the Nova Urban series, alongside its Sideriser 2 and MK250 height adjuster. New on Cogent’s stand was the Hawk passenger seat, which has been designed using anthropomorphic data developed by the company. It has been tested on most floor systems and fixings and can be configured to anything from an accessible seat with ABS back and grab headrest to a luxury minibus seat. It has been tested to meet Reg80 and Reg17 standards. A new testing centre for the company’s seats is just about to be made operational. Displaying a wide range of seats was Kiel. It showed several variants for differing applications, including its Lexxo for regional transport. It has been designed to look modern and provide high levels of comfort. It also had seats for city buses (the Esos and Ideo) and for coaches (the Ligero). Frank Riola of Abacus and Politecnica was promoting his range of seats. There was one in particular he was proud of, which he had developed for war veterans in aid of charity, Help for Heroes. Distinctive Systems had two stands at the show, with one focusing on its fleet management solutions, whilst the other promoted its Coach Hire Exchange offering. There was a chance to win a car in a draw on Don’t Travel Empty’s stand. The company was promoting its job matching website, which is aimed at reducing the amount of empty journeys users’ coaches make. Roeville was letting visitors know about the advances it has made to its WebRes bookings and reservations package. It now has better integration with social media and blogs. It was also promoting its ability to link its management systems into Don’t Travel Empty’s Services. At the heart of 21st Century’s message during the show were its capabilities in creating a connected journey for passengers. The business is aiming to ensure seamless transport is possible, integrating equipment and systems to create a single multi-modal passenger experience. Its acquisition of RSL in Coventry has helped in this goal, allowing it to add further technology to its range, including new interactive terminals. The company’s applications include real time passenger information, ticketing solutions, CCTV and telematics and driver behaviour devices amongst others. Actia was launching its Parts Direct service, which supplies replacement hardware for its existing systems. It has the capability to offer brand new products for legacy vehicles. The technology specialist has been supplying its electrical products into the industry for almost 15 years now and can now offer new replacements for them. As vehicles get older, it can also undertake repairs for equipment no longer in production. Alcolock GB showed its range of breathalyser systems, including its original in-vehicle breathalyser immobiliser. The device is connected to the ignition system, meaning it cannot be started without a successful breathalyser check. It also has a wall mounted breathalyser system, which can be used for random alcohol checks in the workplace, and was promoting its Alcohol Safety Products (ASP) hand held breathalyser tests. Displaying its products in its own right to the bus and coach industry was Aquarius. The ClockWatcher solution is an analogue and electronic tachograph analysis system designed to allow customers to self-analyse and manage their own driver and vehicle data. The eSign touch screen digital signature system was also shown. The sofware is for capturing driver signatures on infringement documentation via a touch screen tablets and PCs. Real time GPS and mobile access to CCTV footage were amongst the capabilities being demonstrated on Centrad’s stand. The CCTV specialist was showing its range of products, which are intended to be ‘plug and play’. The company also provides vehicle Wi-Fi, destination displays and reversing systems. A new tachograph unit was displayed by Continental Automotive. It has been designed with less buttons, a new front and print draw, as well as a CANBus ‘sniffer’, which can detect fuel usage and RPM from the CANbus. Like all modern tachographs, it makes use of the one minute rule. The company also showed its Fleet Visor fully integrated telematics system. This gives vehicle location, route and driver planning, vehicle deployment and remote tachograph download. Cummins range of new ISB SmartEfficiency rated engines were being displayed in preparation to meet the upcoming Euro 6 OBD C requirements for the next phase of Euro6. Key changes to them include: The NOx emissions threshold detected by the system is reduced from 1500mg/kWh to 1200mg/kWh; particulate matter emissions detection threshold is introduced at 25 mg/kWh; the level at which sub-standard quality Adblue is detected is lowered from 0.9g/kWh to 0.46g/kWh; and OBD diagnostic operation must report how many times the monitor actually successfully runs per the number of drive cycles. Amongst Currency Tech’s equipment on show was the CTL Cash Safe-TS, its newest product for the bus and coach industry. The bus driver cash deposit solution features a coin collection box, a single note acceptor, a 1,200 note cassette and a touch panel control system. The company aims to offer a comprehensive support package, including access to a help desk, FLM telephone support and spare parts. It is available at a price of £299 per month for five years. As well as passenger counting systems, DILAX displayed its seat management package, which shows upper deck seat availability. It uses pressure monitors on seats to gauge how many are taken, displaying the availability on a screen. As well as sensing pressure on seats, it can alternatively use thermal sensors, detecting temperature differences between people and the ambient environment. The company was also displaying new functions for capturing and analysing fleet data in real time, as well as its seat reservation display system. A Euro6 beating SCRT device was displayed by Eminox, which is designed and manufactured in the company’s Gainsborough headquarters. The system is said to achieve near zero emissions when upgrading a vehicle to Euro6 levels in real world urban operation and help buses and coaches meet emission standards for the 2020 London Ultra Low Emission Zone. It reduces NOx by 95%, NO2 by 96.7% and particulate matter by 98.8%. A safe pedal management system, Footright, was displayed. Designed to reduce unintended acceleration caused by the driver mistaking the throttle for the footbrake, it works by demanding a series of inputs before allowing the accelerator to be enabled. It can be installed in various vehicle types, including CANbus and non-CANbus variants. New to the UK market is GEPTec whose ETM 500 Ticket machine is designed to be a sturdy and cost effective alternative to touch screen ticket machines. It can be supplied configured to company data requirements and with bespoke logos. It carries out all cash operations with integrated receipt printer and is suitable for private operator networks with smart season tickets and electronic wallet systems. Prices are from £295 plus VAT. Integration was the key word on GreenRoad’s stand. The driver behaviour monitoring system provider was promoting the fact it can link it into a series of additional functions, such as GPS monitoring and coach management systems. Andy Cozens said the company is now moving out onto a global scale, with the product being used across Europe and further afield. New on Icomera’s stand was the M4X multi-radio mobile access and applications router. The device uses patented software to combine multiple networks for fast, reliable in-vehicle internet access. Designed to support multiple applications demanding more resources, this is the latest model in its M-Series, featuring a dual-core processor, 8GB of RAM and up to 1TB of SSD storage. The M-Series passenger information portal, which allows users to deliver information content to passengers using the M340 router model’s onboard storage, was also shown. Promoted by INIT was its Mobile-Plan planning software, which is equipped with various optimised algorithms for fast timetable duty planning. Additionally, there was INIT’s Mobile-Perdis software for organising the staff deployment process, from transferring data for payroll accounting to creating rosters. 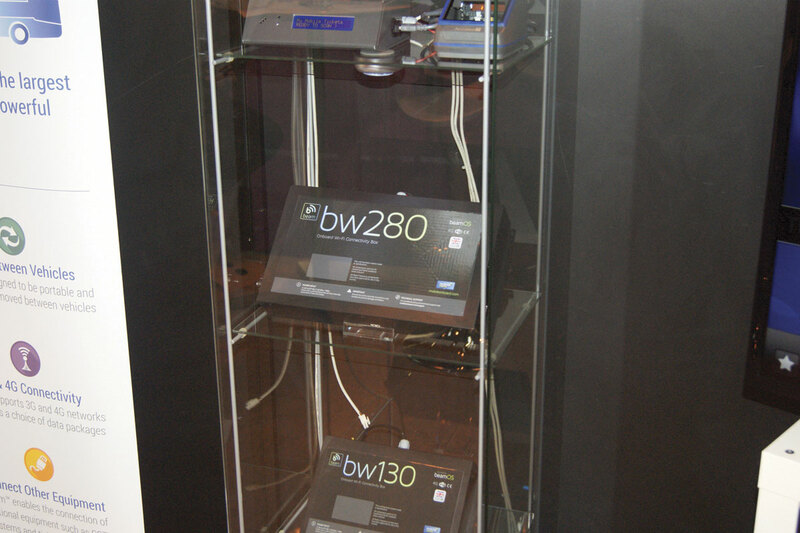 In-Car PC and Bowmonk shared a stand, promoting not only the latter’s workshop equipment, but the former’s bespoke onboard computers. Big news on Lytx’s stand was that its DriveCam Programme is being utilised by National Express on its coach fleet in a multi-year contract. The device records both the road ahead and the driver’s behaviour and transmits the footage for review when certain events occur, such as hard braking. This is combined with predictive analytics, driver coaching and a managed service to better protect drivers. The cameras are being rolled out on 720 vehicles. It was also recently announced that Selwyns Coach Hire and Uno Bus have rolled the solution out too. Justride, Masabi’s mobile ticketing platform package includes a customer app, web sales portal, a ticket inspection system and a real time reporting solution. 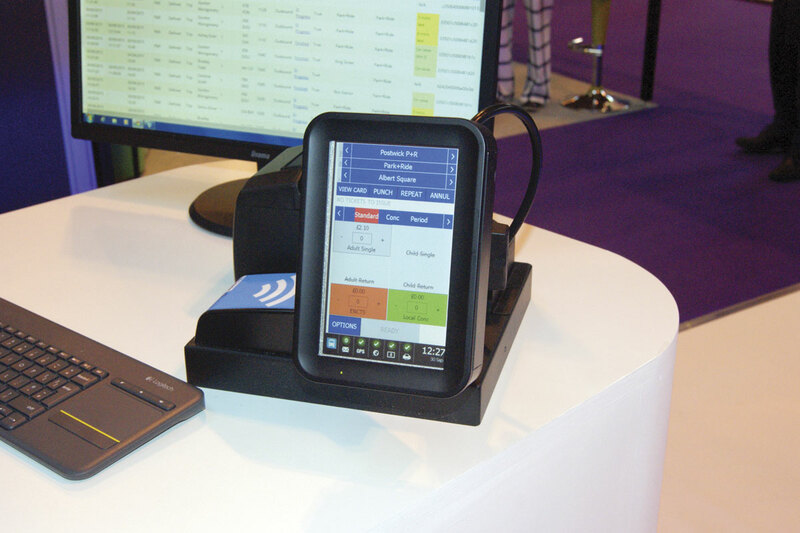 Making its trade show debut was MiX Telematics’ MyMiX driver engagement platform. The package provides 24 hour access via the web or a mobile device to key performance information. Driver scoring is the first component on MyMiX, which is available from iOS or Android mobile devices. Further news was the roll out of telematics services to Go-Ahead Group for the next three years. New on Mobile Onboard’s stand was the Beam 200 series. The Wi-Fi unit is designed to provide even more capabilities for on-vehicle internet connection. Designed to be easy to install, the bw230 and bw280 models use 4G connectivity and power onboard passenger information systems, deliver passenger infotainment, stream media onto passenger’s own devices and connect wirelessly with onboard systems such as CCTV. Additionally, the company has a new casing design for its Wi-Fi units. Other developments are also imminent. As well as its Oilmaster automatic oil distribution system, Groeneveld was also promoting its Fluidmaster. The latter product is a fluid level indicator solution. The device can monitor up to eight different fluid levels with non-invasive sensors. The LEDs inform the driver of low fluid levels. It can be adjusted to allow for the oil drain downtime of different engines and can be fully automatic or manually operated. Omnibus launched its myDAS Touch device, the latest development in the OmniDAS driver self-service module, linking drivers directly with the depot allocation system. The application allows drivers to access all their own details, including rota and holiday information, from their phone. Drivers can use the myDAS Touch app or the company intranet to view their upcoming shifts, used and available holidays, and hours worked. They can also submit requests for holidays, shift swaps and overtime. The secure myDAS Touch app can be installed on all modern smart phones. Additionally, the company had an AEC Routemaster on show, which was displayed to mark its 25th year in business. Making its first appearance at the exhibition was Parkeon’s new Wayfarer 6 driver console. The machine offers multi-format contactless capability, including contactless EMV cards, as well as barcode reading, 4G connectivity, location aware SatNav and route learning. Additionally, it can provide real time information, fleet management, CCTV and passenger Wi-Fi. Transdev are to be the first to roll out Wayfarer6 following an official presentation ceremony on the stand. New from Scan Coin was the CDS9 cash deposit system. For use with coins and notes, it is designed to offer a complete cash handling solution, providing data that is identifiable by driver and deliverable across a network in real time. It was also promoting its recent contract win with TfL for the supply of coin and bank note handling systems for the Underground. Having celebrated its 25th anniversary earlier this year, Synectics was promoting the level of integration its systems can achieve. Joining up onboard and back office equipment, it has the capability to combine communications (for example, 4G and Wi-Fi), data, video and management platforms (such as its Synergy 3 software) into a single customer focused, integrated solution. One new piece of hardware was its tablet unit for fleet checking and other administrative activities, which is intended to save on paper work and should help avoid the problem of illegible hand writing. Ticketer was announcing the fact it had significantly increased the speed of its remote ITSO top ups and greatly enhanced the hosting capabilities of its ticketing machine. The company has been busy developing the ETM with upgraded performance, an improved printer function and an optional barcode/QR code scanning module, while maintaining its compatibility with previous generations of Ticketer ETMs on the Ticketer portal. This is complementary to the company’s fully functional Hand-Held ETM, which was launched last year. Live field trials of its EMV ‘wave-and-pay’ functionality are about to start with full deployment expected later this year. Changes have not all been on the hardware side. Ticketer has continued to extend the capability of both the ETMs and hosted back office, including enhancing the company’s integrated Schedule Adherence package (launched last year) based on feedback from customers. In addition, Ticketer has boosted the performance of its ITSO remote top-up capability, with top-ups regularly being collected on bus within an hour of purchase. Launched was Timespace’s new V500 CCTV digital video recorder (DVR). Building on the previous 400’s success, this new model offers 16 channels of analogue video plus eight of 1080P (HD) video recording. The DVR is compatible with Bridge Alert, the company’s new warning device for low bridges. It is also compatible with LANLink and its Wi-Fi100 onboard router to download incident footage. Transmach was showing its latest product, a hand held Casio ticketing unit. 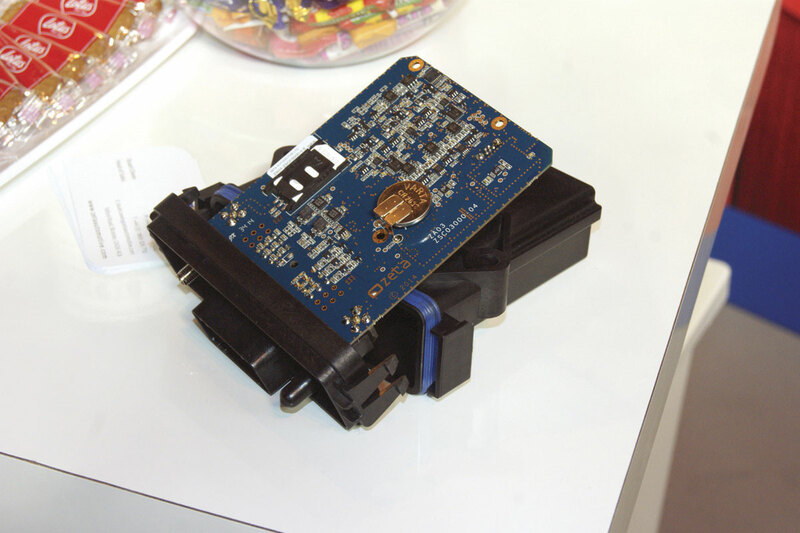 The device can be used with smartcards and has GPS capabilities, allowing the vehicle it is on to be tracked. Representatives from the company say it is ideal for commuter and school services. Welcoming visitors onto its stand for coffee and refreshments was Zeta Automotive’s promoting its EconoSpeed Connect acceleration control unit. The device has been doing well in the bus and coach industry, having been further rolled out across Arriva’s buses and into trials. One of JTT Equipment Services’ Speedywash walk-round washing systems was spinning during the show. The product is the company’s best selling item to the bus and coach market. Sefac was proudly presenting its latest mobile column lift, the SW2 Wireless. Designed to be intuitive and user friendly, the columns have a multi-function LCD screen, activated by swiping a user card over it, to activate each lift. The display shows real time indication of the lifting height and load, reminders of any future technical inspections required and a battery level indicator. To keep maintenance low, the lifts use a re-circulating ball nut and screw, which only requires greasing every five years. With images of examples of its work was Thorntons. The company can carry out various refurbishment tasks, from repairing bodywork to re-sprays and interior upgrades and changes. TotalKare displayed the capabilities of its S6cf cable-free mobile column lifts at the show. Triscan had a range of fuel pumps on show. It was also promoting its Kisskey OBD automated fuel management device and integrated fuel management systems. With a few examples of its test station and workshop equipment was VL Test Systems. Further information on its products was available from the team and via its catalogues. Taking its first steps into the UK bus and coach market was Whiting, a US manufacturer of vehicle wash systems. According to representatives on the stand, unlike others on the market these products are designed to last considerably longer. Having had significant success across the US, the products are now being brought over to Great Britain. Various designs are available, able to wash all sizes of PCVs. With various examples of its uniforms and workwear was First Corporate Clothing. Pride and Joy Clothing were giving people the chance to have their picture taken in an array of fabulous garments! The company also had the latest in its workwear on show, as well as launching its new bespoke order forms. Displaying examples of its workwear range was Trademark Clothing. The business is the uniform supplier of Lucketts Travel, as well as a number of other coach operators. As well as its embroidered and printed garments, it also creates promotional branded items. Shown for the first time at Coach and Bus Live was Uniform Express’s new design for Reading Buses’ uniform. The company had a range of examples of its workwear, with soft shell jackets and elasticated waist trousers proving popular currently. In particular, it was highlighting what benefits uniforms can achieve.